Phillip Stewart, NRCS Texas, shows one of the high water marks that highlights just how high the flood waters rose on Jack Carraway’s Liberty County ranch. Harvey made landfall in Rockport as a Category 4 Hurricane with sustained winds over 130 mph causing excessive damage and complete destruction of buildings. The city of Houston and entire southeast region of Texas experienced the worst flooding that Harvey had to offer as it moved inland and stalled out for days. While daily news coverage focused on the impact upon urban populations, farmers and ranchers in rural southeast Texas were also feeling the wrath of Harvey. “Hurricane Harvey was a lot different than anything we have experienced here in south Liberty County,” said Jack Carraway, who has spent a lifetime ranching in the southeast region of Texas. Almost two weeks after Harvey struck, Carraway was still unable to get to all of his Trinity River bottom pasture to fully assess the damages. It had been nine years since a hurricane made landfall in Texas. But Carraway and his family were monitoring the situation and watched as Harvey developed into a catastrophic storm headed for landfall in Texas. Evacuation plans for his cattle began in earnest. Two days prior to landfall, Carraway began moving his cattle off 1,000 acres of his Trinity River bottom land. Harvey made landfall on Friday, August 25, and by Saturday morning the hurricane had dumped 17 inches of rain in the area. Carraway’s eyes got moist and he took a minute to compose himself when he recalled that morning. However, in the end, the water had risen so quickly and was moving too swiftly to push the cattle solely on horseback, so boats were used to finish the gather. He later found two of the three calves. The third calf Carraway saw swimming north in flood waters five days later when the water was at its peak. “I assume she is dead,” he added. According to the news reports, floodwaters rose to 32.74 feet. The previous record was a little less than 31 feet, noted Carraway. The farming and ranching community is a strong family during good times and bad. Carraway suffered losses and neighbors and strangers immediately began helping him recover post Harvey. He lost cattle, 200 round bales of hay, fencing and 1,000 acres of pastureland that will need time to recover from the flood waters. 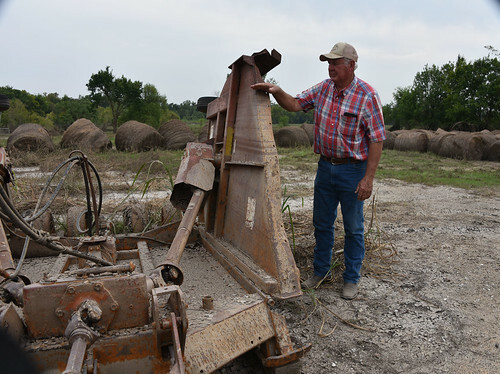 In the wake of hurricane Harvey, Liberty County rancher Jack Carraway was left with destroyed hay bales and fencing when the flood waters finally receded. 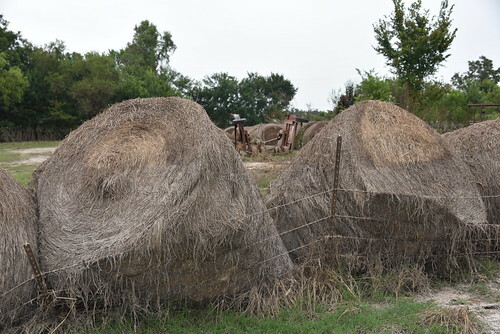 He shared that within two weeks of landfall, he had received 20 round bales from north Texas, one neighbor donated 25 acres to cut hay on and another donated 15-20 acres to cut hay. 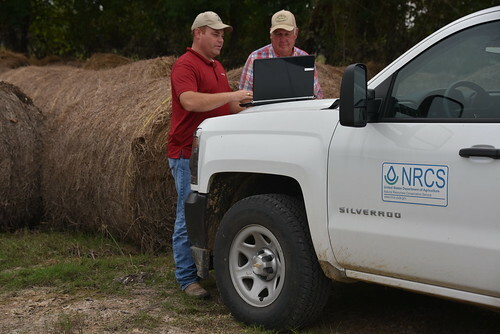 The USDA Natural Resources Conservation Service (NRCS) was one of many federal and state agencies, universities and agriculture partners that also began an immediate recovery response effort in the wake of Harvey. Liberty County rancher Jack Carraway notes the high water mark left on farm equipment. Carraway is not one to ask for financial assistance, however, within days of Harvey’s landfall, he visited his local USDA Service Center. 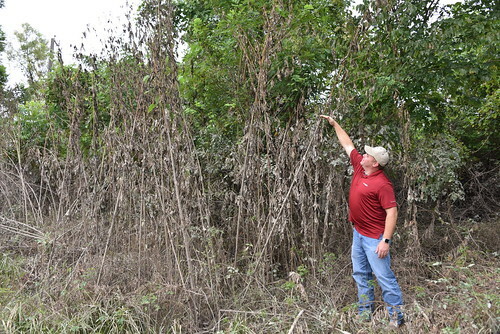 “I have visited with the Farm Service Agency with the USDA and the NRCS to see if there is assistance in any way to help me with my hay, my cattle, my temporary pasture situation, my fencing all those are things that I need help with,” he shared. 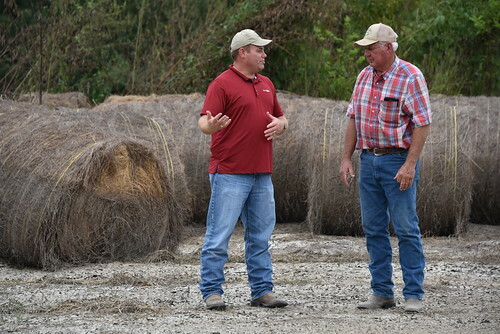 Phillip Stewart, NRCS Texas (left), visits with Liberty County rancher Jack Carraway about available assistance post hurricane Harvey. For farmers and ranchers impacted by Hurricane Harvey in the 39 Declared Disaster Counties along Texas’s entire Gulf Coast region, Disaster Workshops are being held right now in each of those 39 counties. During the workshops, producers will hear from USDA agencies such as NRCS and FSA and partners about the financial and resource concerns assistance available through USDA. Disaster workshop information and the contact for your local USDA Service Center can be found at www.tx.nrcs.usda.gov.